Caley Thistle defender Brad Mckay reckons his side have outplayed Ross County in the Highland derbies this season. Inverness will be seeking their first derby victory since March 2016 when they make the trip to Dingwall for Monday’s Scottish Cup last-16 tie against the Staggies. Following two draws between the sides, County made the first breakthrough when they defeated Inverness 2-1 at Victoria Park in December, despite John Robertson’s men dominating large spells of the game. 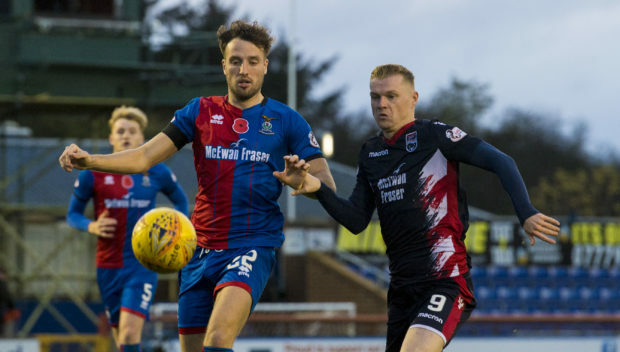 Mckay believes Caley Thistle’s displays against County have merited better results, which makes him confident of getting the better of their rivals this time around. He said: “I think we have been the better side every time we have played them – I don’t think it’s a question. “When we have played against them, even a couple of their players have asked us why we have not been winning by three or four goals. “We all know what it’s like in football, if you don’t take your chances the next thing you know you’ll be 1-0 down. But when their players are saying that to us, we know we are on top. “Fair play to them, that’s how they have ended up where they are in and around the top. “They grind out results, and I have heard there have been a few games where they have not been the best team but they have ended up winning. That’s how teams go places, and I think that’s what we need to bring into our game. “If you said to us that we wouldn’t play as well as the other team and win 2-1, we would take that rather than playing as the better team and getting beaten or drawing all the time. Former Hearts and St Johnstone player Mckay, who made his 100th appearance for Caley Jags in the previous round’s victory over Lowland League side East Kilbride, admits to being somewhat disappointed by being drawn against a Championship rival. He added: “I’m not sure the boys really wanted to draw County. We play them four times already so it’s a bit disappointing. “I don’t know if they will be feeling the same, but you’re hoping to get somebody different. “We played East Kilbride in the last round which was a bit different, although it was fairly straightforward. “It’s not as if we wanted someone bigger – that’s a bit disrespectful – but somebody in the top league would have been a decent draw.